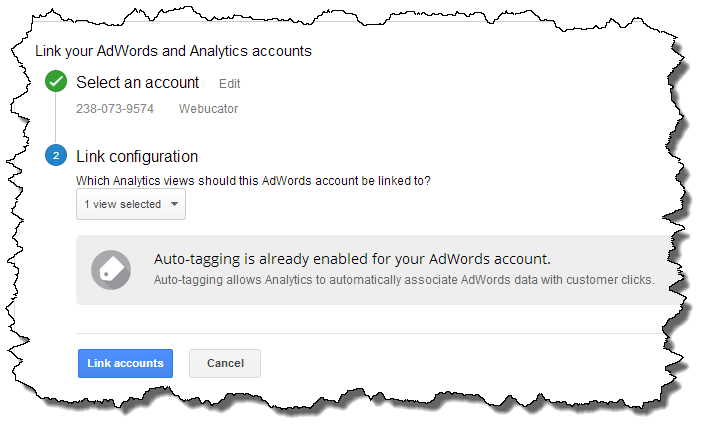 How to integrate Google Analytics with your AdWords account. How to analyze Google Analytics Reports for AdWords. How to filter out Google AdWords Data into a separate profile. Navigate to your Tools tab, then click on Linked accounts. Click the Google Analytics and connect your Google AdWords account with your Google Analytics account. Note that you need to be using the same Google email address. Within your Google Analytics account, click on Admin, and then choose your desired account. Under the desired account, click on AdWords Linking. Choose + New Link and choose the desired AdWords account to link to. To finalize, choose Link Configuration and then decide the appopriate one. Choose Link accounts to complete. 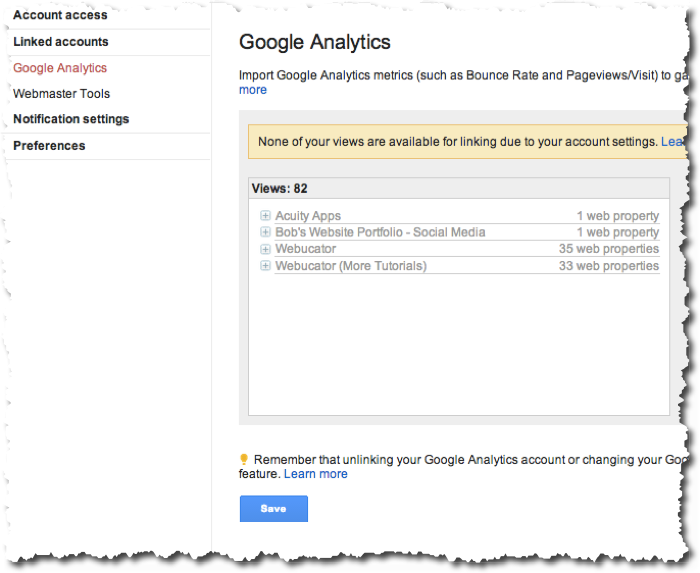 See the attached screenshot for complete Google Analytics setup. All your AdWords data (impressions, clicks, cost) will automatically be imported into your Google Analytics account. AdWords Reports in Google Analytics convert raw data into presentable information. In addition, Google Analytics provides an interactive segmentation which enables you to reorganize the data on the fly. AdWords impression cost, position, and click-through data are fetched from your Adwords account once per day. AdWords Campaigns Campaign level information. Helps in analyzing the traffic coming from each campaign. Keyword Positions Indicates position of your AdWords ad when the visitor clicked it. T.V Campaigns Allows you to view and compare Google TV Ads campaign metrics with regular Web site metrics. Keywords (Beta) Allows you to analyze the correlation between bid terms and search terms. Compare the site usage (visits, pages/visit, etc) with respect to regular site traffic. Study the impact on ecommerce activities (transactions, revenue, etc.). 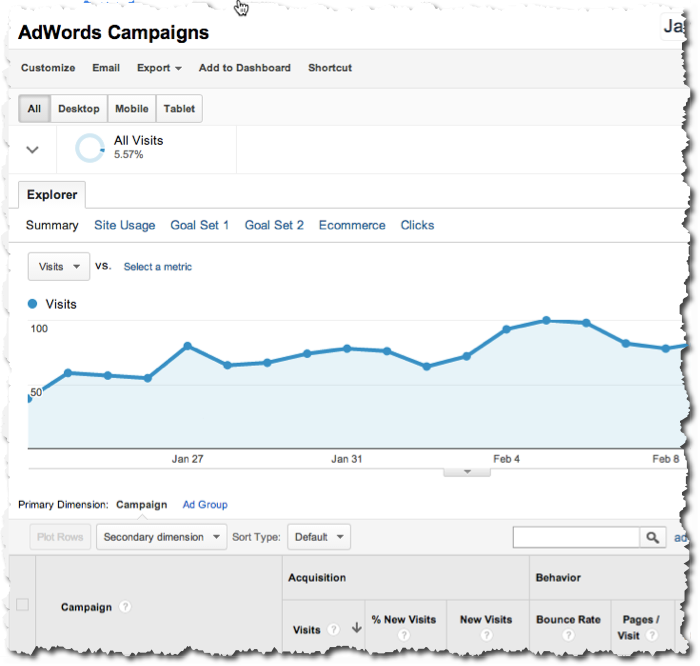 In the above screen shot, notice that the campaign data is segmented using Visitor Type (i.e., based on New or Returning Visitors). We will discuss other reports during the course. Create a new profile and name it AdWords Traffic. Create a new custom filter, with type = Include. Filter Field = Campaign Source. Apply this filter to the newly created profile named AdWords Traffic. Create another custom filter with type = include. Filter Field = Campaign Medium. Apply this filter to the same profile.